HomeArchiveAUDIO INTERVIEW: AFP at the Anti-AIPAC Protest in D.C.
AMERICAN FREE PRESS was on the scene of the anti-AIPAC protest in Washington, D.C. on Sunday, March 20, where hundreds of protestors clashed with attendees and police, on the first day of the pro-Israel policy conference of the nation’s most powerful lobby, the American Israel Public Affairs Committee, where every U.S. presidential candidate, as well as U.S. congressional leaders, will pledge their allegiance to the Zionist state over the next few days. Mark Anderson caught up with Rabbi Joseph Kohn of the religious group Neturei Karta, whose motto is Jews United Against Zionism, where he discussed his opposition to Zionism and the state of Israel, in this important interview (4:03). 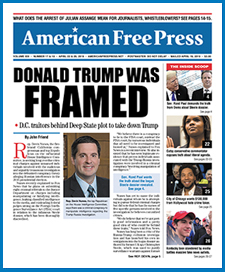 Mark Anderson covers the annual Bilderberg meetings and is chairman of AFP’s new America First Action Committee, designed to involve AFP readers in focusing intensely on Congress to enact key changes, including monetary reform and a pullback of the warfare state. 4 Comments on AUDIO INTERVIEW: AFP at the Anti-AIPAC Protest in D.C. According to FBI whistle blower Sibel Edmonds, all Islamist terrorists are part of a false flag operation by Western-Israeli-NATO intelligence, code named Operation Gladio B, whose objectives include: “projecting U.S. power in the former Soviet sphere of influence to access previously untapped strategic energy and mineral reserves for U.S. and European companies; pushing back Russian and Chinese power; and expanding the scope of lucrative criminal activities, particularly illegal arms and drugs trafficking.” Check it out in Wikispooks. Google: Bloody Masonic Fingerprints Left On 9/11 Crime Scene.